This is an interdisciplinary study of the Bible and visuality. It is the first to be written by a historian of visual culture (that is, aspects of culture mediated by visual images) rather than a biblical scholar, and unlike some previous studies, it makes equal partners of image and text. The Bible as Visual Culture also bridges a longstanding gulf between the interpretative traditions, languages, and reading conventions of the two disciplines. 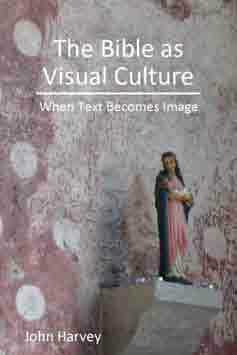 The book’s central question is: What happens when text becomes an image? In response, the study explores how biblical ideas are articulated in and through visual mediums, and examines ways in which visual culture actively shapes biblical and religious concepts. Using original research material, Harvey’s approach develops a variety of new and adaptable hermeneutics to exegete artifacts. The book applies theoretical and methodological approaches—native to fine art, art history, and visual cultural studies but new to biblical studies—to examine the significance of images for biblical exegesis and how images exposit the biblical text. John Harvey draws upon a breadth of fine art, craft, and ephemeral objects made, modified or adopted for worship, teaching, commemoration and propaganda, including painting, print, photography, sculpture, installations, kitsch and websites. These artifacts are studied chiefly in the context of the late-modern period in the West, from a Protestant Christian perspective for the most part. The Bible as Visual Culture is directed to academics and students of biblical studies, theology, religious studies, ecclesiastical history, art history, visual culture and art practice. It provides an accessible introduction to the field, informing newcomers of existing scholarship and introducing new concepts and theories to those already in the field. John Harvey is Professor of Art at Aberystwyth University, Wales. Students of scriptures—of many stripes—may find something with which to resonate in Harvey’s provocative work. As a whole, The Bible as Visual Culture provides a significant methodological suggestion for further work in the spaces between “bibles” and “images.” Given that the world in which we live exhibits complex relationships between people, words, and pictures, and given that biblical literature and themes continue to serve as sites for the articulation of power/knowledge and identity/culture, it stands to reason that biblical scholars, art historians, and working artists would profit from interaction and interlocution with one another, not to mention with anyone else who would like to come along for such a ride. Davina C. Lopez, Review of Biblical Literature.